Walk out the front door of The Fairview, and soon you can be standing at the door of Vespaio Ristorante. Open since 1998, it is one of the places that’s made South Congress what it is today. Locally sourced and handmade food, lovely atmosphere, attentive service – those are more intangible details which, when paired with delicious food, add up to a really superb meal. If there is a wait for a table, take advantage of their bar and enjoy the house-made antipasti. Next door to Vespaio is Enoteca Vespaio, a more casual dining location which shares a kitchen and philosophy with its more formal sibling. With a lovely patio on the side, it’s the perfect location on a sunny day or warm evening for lunch or a light dinner. They have a very tempting showcase full of yummy desserts that are almost impossible to resist. 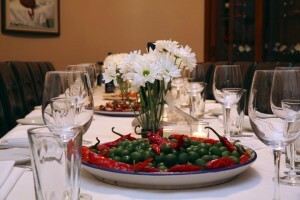 Both Vespaio Ristorante and Enoteca Vespaio are able to accommodate diners with food allergies. They offer gluten free pasta and when we have eaten there we’ve found the waitstaff understand cross contamination issues and can steer you clear of potential problems. Getting there from The Fairview couldn’t be easier. It’s a short, pleasant walk through the neighborhood of about 1/2 mile and should take about 10-12 minutes. Walk out the front door of The Fairview, down the sidewalk, turn right on Newning, then right again on Monroe, cross Congress and go left on Congress. 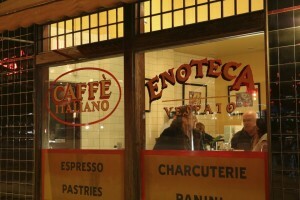 Vespaio Ristoranti is on your right in the building on the end of the block, Enoteca is next door at the far end. If you drive there is a parking lot right behind the restaurant off Milton, the cross street. We hope you will check here again for more of our Fairview Recommends posts. Until then, Buon appetito!